28" dia. 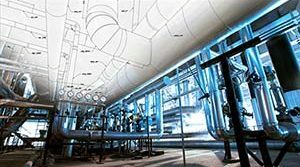 Hot Shoes for a Natural Gas Plant | Piping Technology & Products, Inc. 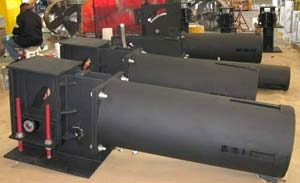 Piping Technology & Products, Inc. recently designed and manufactured twenty 28″ dia. 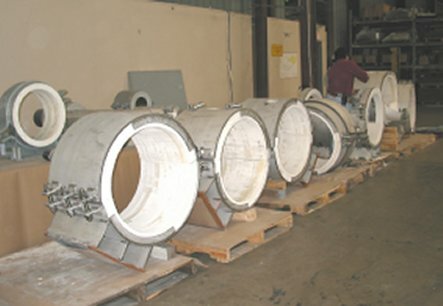 Hotshoes (high temperature pre-insulated pipe supports) for a natural gas plant in Massachusetts. These supports are assembled with a 5″ thick high-density Calcium silicate insulation layer, in addition to stainless steel, Kaowool, and PTFE, 25% glass filled, slide plate materials. The supports are designed to support loads from 25 kips-50 kips at an operating temperature of 1800 degrees F. The shoes also allow for a travel of 7″ where applicable. PT&P also designed and fabricated rod hangers with variable spring supports for this project. Do you have a need for hot shoes in your plant or refinery? Get pricing today!